The Pirate Empire: Fire Ship! 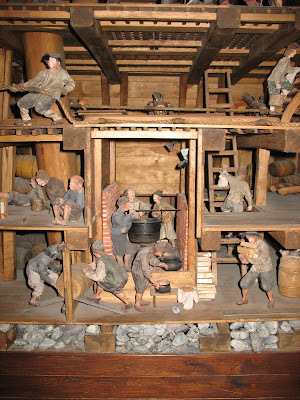 The Golden Age of Piracy was a time of wooden ships- wooden ships, held together with tar, and waterproofed with pitch. They were floating death traps, tinderboxes, piles of kindling. And they were filled with fire. The galley, of course, kept a kitchen fire burning. The best kind of galleys had a floor lined with sheets of tin, an effort to keep sparks from setting the ship alight. Often the only “stove” was a steel box to hold the fire. The box might be sitting in a bed of sand – a known insulator – or it might contain sand, as a base for the fire. But the fire, a simple thing like a campfire, burned night and day. It was necessary to cook food for perhaps a hundred men, in a space perhaps six by six feet. Pots of boiling water were secured on the moving ship as well as they could be. An overturned pot could mean scalding wounds that meant almost certain death, either from the immediate injury, or, more horribly, from lingering infection. 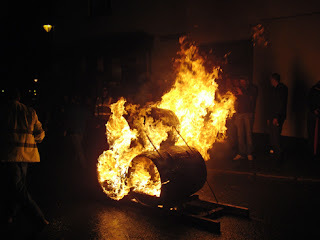 But there was much more fire. Every light source was fire. 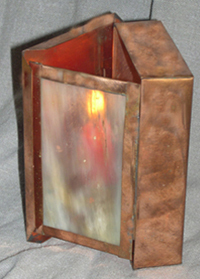 Lanterns, candles, everyone was a possible source of conflagration for the entire ship. Of course, precautions were taken. Simply the fact that almost all candles were confined behind glass was one. However, in these primitive times glass was sometimes not available. In this case, very thin pieces of animal horn, straightened by boiling or soaking in ammonia, were used as we might use plastic. Of course, this meant that the light of the candle behind the protective layer of horn was dimmed by the non-transparent layer, but it was better than setting the boat on fire. Smoking was also often prohibited. On merchant or navy ships smoking might be completely banned, but pirates embraced a more easygoing lifestyle. In order to allow their crews to smoke as they liked, pirate ships permitted the practice, but limited it to the open-air deck. 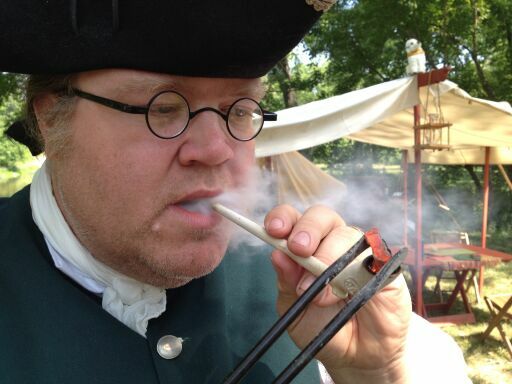 Some pirate ships even supported open-air smoking by providing their crews with a long, slow-burning fuse on deck, which made lighting a pipe easier. They also might provide a tub of wet sand for extinguishing pipes and cigars. Most secure was the powder room. Home to the ship’s gunpowder, this room was as completely secure as the technology of the time could make it. Not only was it sealed tightly, but no lights -candles or lanterns. Instead, a window – leading into the rest of the ship, and covered with unbreakable horn, not delicate glass – let illumination in. Anyone working in the powder room, either stowing supplies or handing gunpowder out to power the cannons during an attack, was required to take off all metal, which posed the danger of striking a spark. These people were also required to give up their shoes. Special slippers were used instead. Pirates didn’t yet understand that static sparks were electricity, but they did grasp that any spark at all could set off the powder and kill everyone on board. So what happen if a ship did catch on fire? For one thing, there was little use putting it out. Literally everything on the boat was flammable. If the fire was tiny, someone might be able to throw drinking water on it. Or if it spread unusually slowly, someone might be able to set up the ship’s pumps to direct a stream of water on it. But fires tend to go up, and that meant flames getting into the great canvas sails. The sails would burn, and drop flaming material all over. Unless luck was on the side of the sailors, the only thing to do was abandon ship. If everyone was quick, the ship’s small boats could be lowered, and people could pile into them. If they weren’t so fortunate, the crew might find themselves in the water clinging to whatever was floating nearby. The boat might burn and sink. Or it might not sink quickly enough, and the gunpowder would explode. Eyewitnesses to such events speak of the ship’s cannons, usually kept loaded, firing themselves one by one, set off by the intense heat. An exploding powder magazine destroyed the entire ship instantly. Bodies of those unfortunate enough to still be aboard were torn to bit and thrown for as far as a mile. If any other ships were nearby, they would probably be set on fire by flying debris. The shockwave could be heard for miles. Humans anywhere in the vicinity were deafened for hours, even days, by the enormous blast of sound. An exploding ship was such a horrible event, it might leave witnesses with PTSD. Pirates – and the military – were happy to put these horrifying facts to use. Setting an older, damaged, or un-needed ship on fire and sending it into a mass of enemy shipping was sure to start a panic. The secret was to steer the un-manned ship into enemy lines, while preventing the sails from catching on fire until it had crashed into the enemy. Doing so was a matter of both luck and skill. 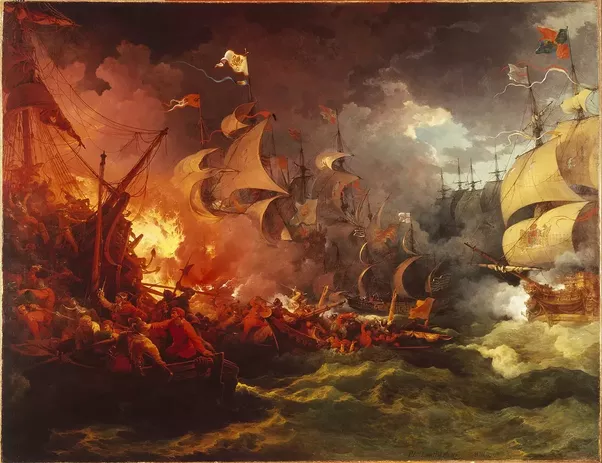 When Spain attacked England with an armada of 130 warships, Sir Francis Drake, pirate, admirable and English patriot, raided their supplies, then sent fire ships into the massed formations. History credits storms for the destruction of this invading force, but Drake, his piratical crews, and their fire ships were at least equally responsible for turning back this invading force and changing the history of the world.